Does Rick Hahn Have Another Move To Make? The big news at the start of SoxFest on Friday was that Robin Ventura had signed a mystery extension with the White Sox. We don’t know how long the extension is for, or how much money Ventura is getting, but he’s signed it. The White Sox swear. What stood out to me on the first day of SoxFest, though, was the fact that Ventura’s extension may not be the last bit of breaking news from the Sox this winter. When the Sox missed out on Masahiro Tanaka I figured that would be the end of the offseason for the team. 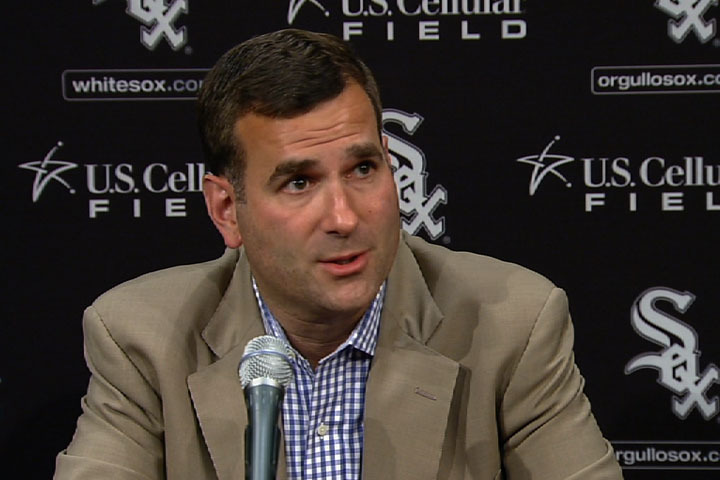 Rick Hahn practically said so himself on SportsTalk Live Wednesday. Now it appears that may not actually be the case. Of all the things said at SoxFest on Friday, there was one quote that stood out to me more than anything, though I didn’t put a lot of faith in it given the source. As a life-long White Sox fan you learn to take anything Hawk Harrelson says with a grain of salt. It’s more self-defense than anything, but Hawk said something interesting nonetheless. The White Sox are getting Yaz! Like I said, when I first saw the tweets from Merkin I basically brushed it off. Mostly because of who was saying it, and also because of this tweet from Daryl Van Schouwen earlier in the day. Yes, that’s a scotch in Hawk’s hands. The Hawkaroo was getting lubed up on Friday, and then he was talking about moves Rick Hahn is planning in his head. So, yeah, hard to take it seriously, as it’s probably just Hawk trying to fire people up in the same way he’s always doing. But then Bruce Levine tweeted something on Friday night that piqued my interest as well. Cubs and White Sox both looking at adding starting pitching . Cubs checking free agent list . So the Cubs and White Sox are still in the market for a starting pitcher, but Levine makes sure to point out the Cubs are looking at free agents, not the Sox. Which makes sense, because I don’t see the Sox giving up money and a draft pick for guys like Ervin Santana or Ubaldo Jimenez. And that would mean the Sox were looking to add pitching through a trade. Is this what Hawk was talking about? Does that crazy old man actually know something!? I can’t honestly believe that if Rick Hahn had an idea, or was working on a deal that he’d be sharing info with Hawk. Right? Jeff Samardzija? The only “unbelievable” thing about Samardzija is that anybody would consider him to be an “unbelievable” acquisition, though this is Hawk we’re dealing with. The same man who is carrying Gordon Beckham’s Hall of Fame torch. Still, this doesn’t strike me as the kind of move Hahn would want to make. If Rick Hahn is going to trade for an “unbelievable” starting pitcher he’s going to want somebody that’s worth the long-term commitment, and Jeff Samardzija isn’t that guy. So who could it be? The only pitcher available that meets the “unbelievable” requirement is….no…there’s no way…Hahn can’t be going after him. Price was the biggest name expected to be moved this winter because the Rays know there’s no way they can sign him to a deal when he becomes a free agent after the 2015 season, but nothing has developed. It’s possible that a real market for Price could form now that Tanaka is off the table, with the teams that lost out on him looking to move in. And maybe the White Sox are one of those teams. The problem with this is, that like Tanaka, I just don’t think the Sox have enough of what it would take to pry Price away from the Rays. Tampa is going to want prospects, and good ones at that. Hahn has done a great job of giving the White Sox more depth in the minors, but the farm system isn’t top-heavy enough to pull off a deal like this just yet. There’s also the money. Even if the Sox did manage to get Price out of Tampa, they’d want to sign him to a long-term deal as quickly as possible, but he won’t come cheap. While the Sox were willing to get in on the bidding for Tanaka, Hahn himself said that the money reached a point where the Sox just weren’t comfortable. Tanaka ended up getting $155 million from the Yankees for seven seasons. Odds are Price is going to command more, as he’s already established. The man did just win a Cy Young in 2012, remember, so Price will likely be looking for a deal closer to the one Clayton Kershaw got. I’m sorry, but that’s just not going to happen with the White Sox. So what is this “unbelievable” deal that Hawk was speaking of? I have no idea. Odds are that if Hahn does have something cooking it’s not nearly as big as what Hawk would want us to believe. That being said, it’s nice to know that the Sox could still make a move this winter. So, at the very least, Hawk gave Sox fans things to speculate and dream about while waiting for the snow to finish melting. This entry was posted in Chicago White Sox and tagged Clayton Kershaw, David Price, Hawk Harrelson, Jeff Samardzija, Rick Hahn, Robin Ventura, Trade Rumors by Tom Fornelli. Bookmark the permalink.